Native to New England, our Cranberry Honey is a treat that you will want to try! Whether you add it to your tea, pour it on your oatmeal or just eat it by the spoonful you will not only reap the benefits from its nutritional value but also, you will be lovin’ every drop of it! Cranberry honey makes a great gift and is something that should be in everyone’s pantry! 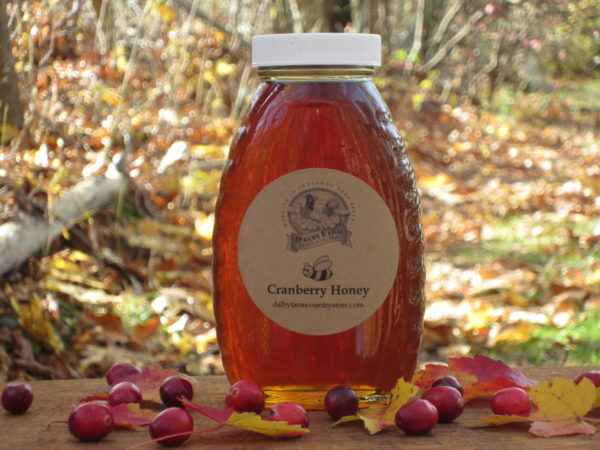 Cranberry Honey is a ‘Taste of New England’! Cranberry Honey is something that is native to New England! This delicious honey makes a wonderful addition to tea, when put on toast or with oatmeal and is so yummy that you will have a hard time not eating all of it spoonful by spoonful. Cranberry honey, like all honey, is not only chockful of nutrients but also because it is so delightful, makes it a necessity for everyone’s pantry! Cranberry honey is a must for any honey enthusiast! For an all-natural remedy of a sore throat, take one teaspoon of cranberry honey several times a day. **Over time, honey may crystallize; you can eat it crystallized or, if you prefer to have it in liquid form, you can put it in a pan of hot water and the crystals will dissolve. Either way, honey is the only food that NEVER spoils! All natural; no preservatives. Created in the U.S.A. by native American bees.